At Premier Health Care we pride ourselves on having a state of the art health care facility and being a source of health information. We have a growing library of materials to help you on your journey to optimum health and keeping you as healthy as possible. 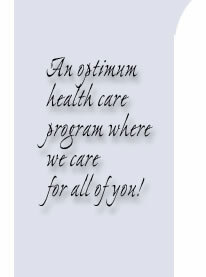 If you have a health care question or would like more information we can help you find the facts. Chances are great that if you are reading this you have already been surfing the web to find information. It can be very confusing and difficult to find the correct information. We can help you find the data and references to back up data. Ask Dr. Shapero or one of our very helpful staff about any questions you may have regarding your care, your condition and your health. We can make the search much more enjoyable.